Iza Malczyk Gallery of artisan silver jewellery. Zen Garden - a new collection inspired by beauty of Japanese gardens. Leaves, textured silver, dark and sophisticated simplicity. 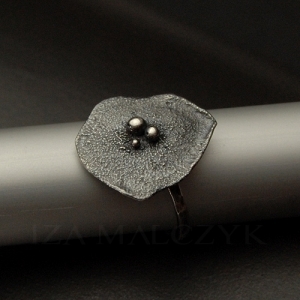 Subtle ring with reticulated leaf topped with silver dots. Tiny hammered band. Heavily oxidised and polished. If you're interested in this piece, please, contact me via the contact sheet.